Creative Coding PD — Wonderful Idea Co. In our creative coding professional development workshops we will explore computational tinkering — a playful, collaborative, and open-ended approach to exploring digital tools including Scratch programming, BBC Micro:bit and Chibitronics Chibichip. 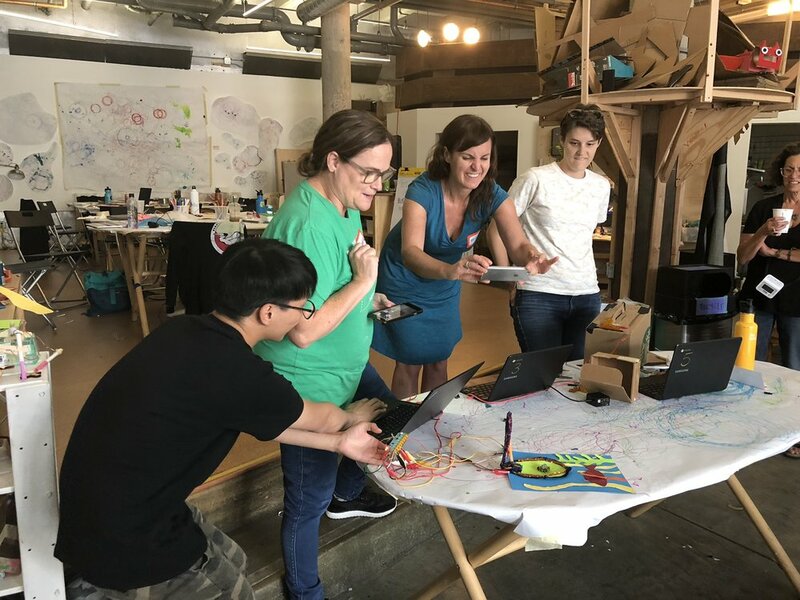 As part of the three-day atelier, educators will experience several hands-on computational tinkering activities as learners, leave with a set of workshop elements, and brainstorm strategies to integrate new technologies to art, science, and making programs. Workshop participants will participate in initial explorations of playful computation using scratch and experience an analog tinkering activity to help us collectively identify the learning outcomes that these activities support. The workshop will run from 9:00 am to 5:00 pm each day with a mix of hands-on sessions, reflective discussions, practical brainstorming sessions, food, and fun. Together we’ll engage with two open ended computational tinkering investigations that focus on crafting with code and playful robotics using tools like BBC Micro:bit, Moto:bit servo motors, hot glue guns, cardboard, Chibitronics Chibichips, copper tape and LEDs. Participants will leave with a kit of materials to continue all the experiments and a resource list with information about where to get all the hard-to-find elements. Over the course of the three days, we’ll reflect on the value of a constructionist approach that encourages students to think with their hands and learn through play as they create, share, imagine and reflect on their own process. 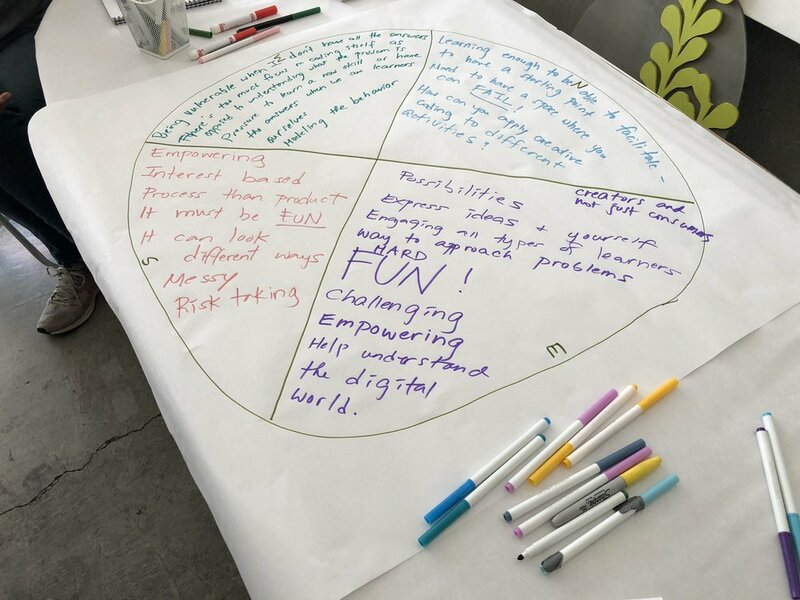 This tinkering disposition can help make topics like coding, computational thinking, STEAM content and 21st century skills accessible and relevant to learners of all backgrounds and interest levels. Each professional development workshop will have a unique focus and delve into an area of computational thinking as it relates to themes like community engagement, digital fabrication, artificial intelligence or e-textiles. Stay tuned for more information about guest presenters and special topics. Jaleesa Trapp will share her work at the MIT Media Lab developing a creative learning guide called “Uncovering Hidden Pathways” that explores an anti-racist, purposed-based approach to engaging non-dominant youth in STEM activities. We’ll reflect on how constructionist centered “creative coding” can radically improve the trajectories of the lives of underrepresented and marginalized students by addressing the race, class, and social barriers in education that prevent access to participation in 21st century careers in STEM fields. Together we’ll consider the ways as educators we can approach designing activities, encouraging mentorship, and making connections for learners across formal and informal settings. We’re interested in learning from each other to explore the possibilities for computational tinkering across different learning environments. The workshop is offered for a substantial discount for a limited number of teachers from Title I Schools. Saskia Leggett cares about empowering people by engaging communities, designing experiences, curating resources, telling stories, facilitating connections, and building relationships. 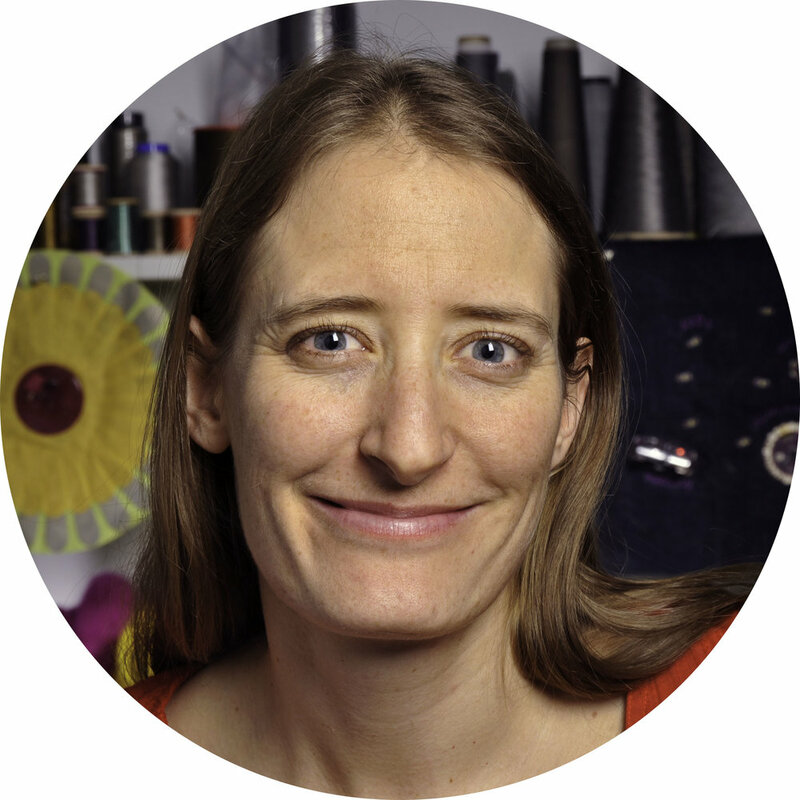 Saskia works at the intersection of creativity, education, and technology, focusing on large and small scale creative learning experiences. Saskia is currently consulting on designing creative learning programming and resources for various Bay Area-based companies across the fields of computing, education, and AI robotics. She previously worked as the Outreach Manager at the Scratch Foundation, supporting creative computing with Scratch at the Lifelong Kindergarten Group of the MIT Media Lab, and holds a degree in Technology, Innovation, and Education from the Harvard Graduate School of Education. Jaleesa Trapp is a graduate student at the MIT Media Lab with the Lifelong Kindergarten research group where she is focused on creative learning and learning technologies. Specifically, she is examining the race, class, and social barriers to constructionism in education through an intersectional lens with the hope to provide solutions to eradicate them - giving marginalized youth access to STEM technologies and equipping educators to provide an equitable learning environment. Prior to graduate school, Jaleesa was the Computer Clubhouse Coordinator in Tacoma, WA - where she also participated as a member from 7th-12th grade. She was also a computer science teacher at the Science and Math Institute (SAMI), and then helped start the Industrial Design Engineering and Art (IDEA) school. Ryan Jenkins is the co-founder of Wonderful Idea Co, a creative studio in Northern California that explores art, science & technology through making and tinkering. Ryan trains educators, develops playful environments, and creates unique handmade exhibits and art pieces for museums and makerspaces. 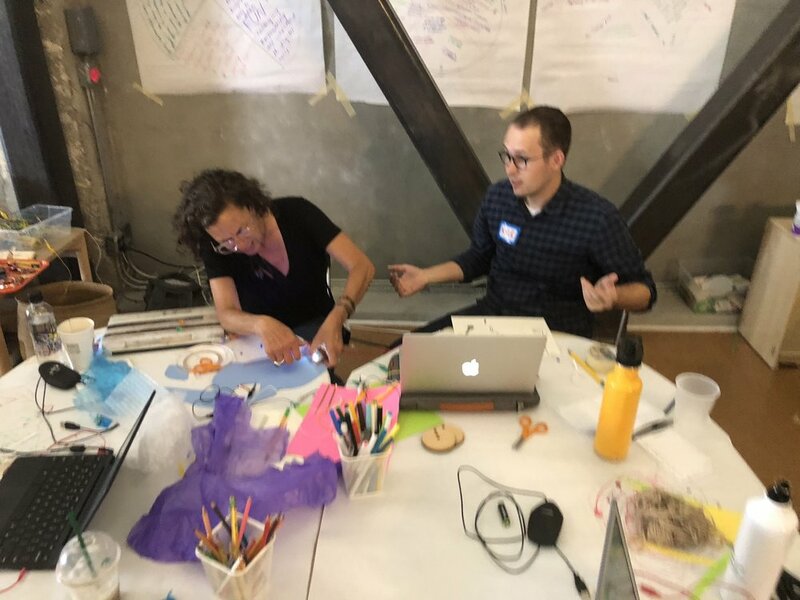 Previously, Ryan was a founding member of the Exploratorium's Tinkering Studio, where he developed many different workshops and activities that have been used, adapted and remixed in innovative education settings around the world. He has worked closely with partners at the Lifelong Kindergarten Group at MIT Media Lab, Brightworks, Make Magazine, Lodestar Community Charter School and Cabaret Mechanical Theater to develop a deep understanding of the latest developments in STEAM education.